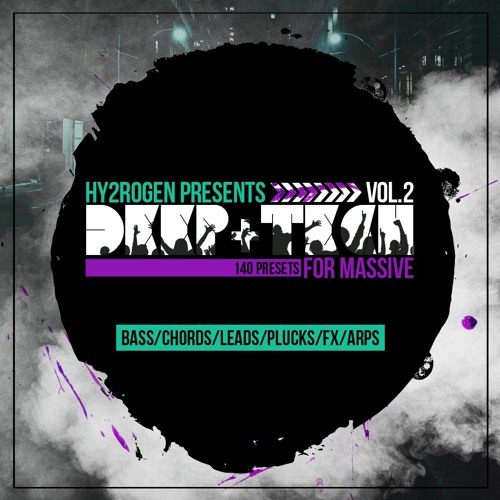 Download: http://hy2rogen.com/product/deep-tech-for-massive-2/ HY2ROGEN returns with #2 of Deep & Tech For Massive tweaking NI Massive’s knobs and internal routing pathways to deliver 140 fresh presets to go around various deep, tech and progressive house influences. Back in stock are those sought after silky chords & stabs, heavy sub hitters, deep milky basslines, useful ARP sequences, generic effects, useful leads and all kinds of pluck sounds to go around for every user. This collection is another must-have for your Massive library and is a great addition to our first installment. This versatile collection can be used across multiple genres such as deep house, tech house, progressive tech, house and even techno. What you get is 140 total presets broken down into 5 sub bass presets, 40 bass presets, 40 chords & stabs, 10 fx presets, 10 lead presets, 5 ARP presets and 30 pluck presets. All of the sounds come with 4-8 macro-controls to help shape the sounds at your liking. Don’t let the demo fool you on what these presets can do, there is much more inside! Attention: The pack contains only sub, bass, chords, effects, leads, arps and pluck presets for NI Massive v1.5 and above. Other sounds like drums and vocal cuts are not included in the pack. These sounds have been taken from various releases here on HY2ROGEN.